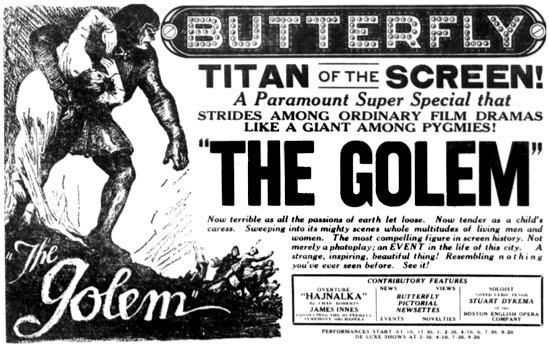 The Golem, not a monster separate from us, but the other within us, manifest in human-like form. Tis the season – autumn getting into full swing, leaves falling, nature baring itself. Likewise, time (and not just because of the season), as Michael Dirda's piece in the great Lapham's Quarterly says, for the realist novel to make way again for stories by authors from Le Fanu to Kafka of the supernatural, metaphysical and the unseen forces at work all around us. Stewart Lee got to talk about the 70 children's TV drama Children Of The Stones in a piece about teenagers on a Charlie Brooker TV show a few years ago and on Thu 4 Oct on Radio 4 he'll explain why the show made such an impact, talk with cast members, fans and one of the co-creators of the series, and visit the stones at Avebury. Unseen forces also seemingly at work as Patrick Ffrench links cinema, literature, psychoanalysis in Spasms: Moving Bodies From Baudelaire To Beckett, a talk on Thu 11 Oct at The Last Tuesday Society in London. Discarded posters by Julian House for the film Berberian Sound Studio hooked me into the fantastic A Sound Awareness blog. Feeling somehow the need to get out of London though, go to a ruin, old or new, somewhere – not least after reading the poem Crosby Beach on another blog I like, Enchanted Isle - "The city becomes a museum of itself/Feasts on its own memories".